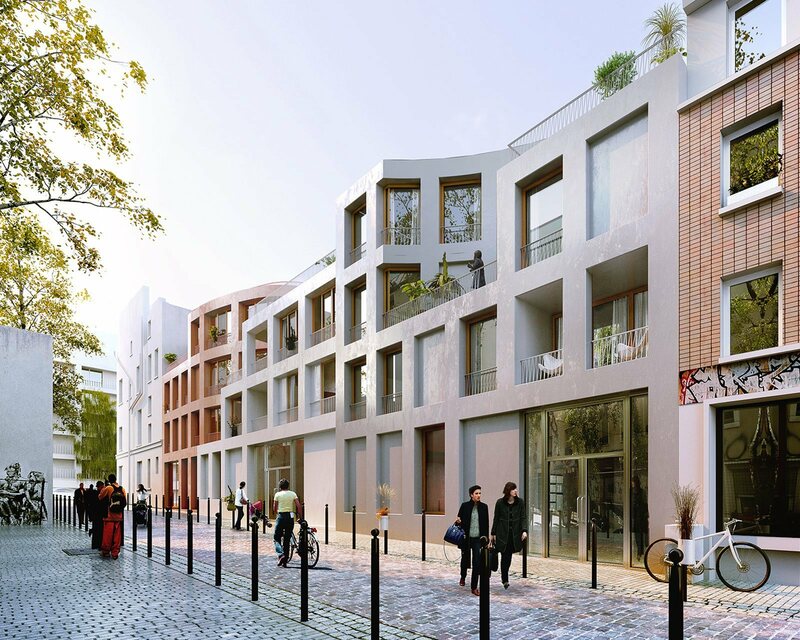 The project is located in the rue Dénoyez which has a very specific atmosphere, away from the agitation of the nearby lively district of Belleville. The construction is in line with the surrounding buildings with controlled heights; it takes into account the depth of the urban block and its housing of various styles and sizes. The street-front façade is divided into distinct volumes, which gives rhythm to its linearity and plays with the slight sloping of the ground. The architecture offers a frank reading of the volumes, without artifice. Work on sizes, on the optimization of the courtyard, on comfortable living conditions and on a general insertion within the urban fabric all contribute to give its strength to the project. The positioning and the dimension of the openings depend on the uses of each typology of housing. The principle rooms are thus positioned at the angles or at the extremities of the volumes so that they can benefit from wider openings, balconies or loggias. The volumes have been adjusted to ensure the entrance of a maximum of natural sunshine including inside the heart of the block, and despite the surrounding urban density. The configuration of the kindergarten, which occupies the whole of the ground floor around the garden at the heart of the block allows for a co-visibility of the different children’s units. This arrangement gives a feeling of unity around a common and shared space.